This afternoon I made a start on my big spare-room clearout. It wasn't long before I decided I'd earned a break, so I collapsed in a heap with a big cup of coffee and a Tunnock's Teacake. For those who don't know, these little beauties consist of a soft biscuit base, topped with marshmallow, and encased in milk chocolate (there is now a dark chocolate version but much as I love dark chocolate I'm a traditionalist where these are concerned). Coincidentally, I've just read Six Balloons comment on my previous post, and although agreeing with her that we do have much less variety in packaging nowadays, I felt the need to share this wonderful iconic box. 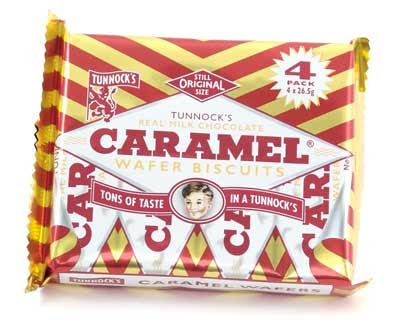 The caramel wafers are pretty good, too. The lovely retro design is continued on their website. I can't end this post without mentioning something that's really important to me as a vegetarian, - the marshmallow is veggie! No "bovine (bleeurgh) gelatine", no "pork (ugh) gelatine". 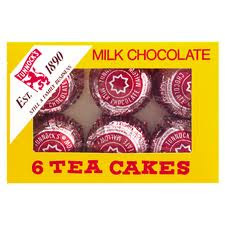 Mmmm I love the teacakes when they're a little bit melted, so tasty. Yes, they are best at room temperature (which today meant they were a little bit melted! ).